You may not fully appreciate the mathematics of signals and systems on your first encounter. To enhance your understanding, you can use computer animation to bring to life some of the more difficult concepts and hopefully make a lasting impression. To that end, a collection of five graphical user interface (GUI) apps are available for download. At this site, click the center tab labeled GUI Applications to open the download links for the apps in one of three popular OS versions. All five of the apps feature user interactivity and animation of some aspect of signals and systems mathematical modeling. 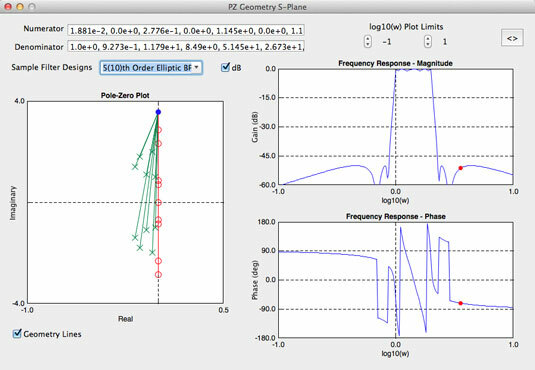 Three of the apps focus on continuous- and discrete-time systems and the relationship between poles and zeros and the frequency response. The remaining two apps focus on sampling theory in the time domain and the frequency domain. For linear time-invariant (LTI) continuous-time systems, you discover the system function and the s–plane poles and zeros. A geometrical relationship exists between the pole and zero locations and the system frequency response, magnitude and phase. The app PZ_Geom_S allows you to explore the mathematics behind this relationship by dragging a marker along the jw-axis in the s–plane. 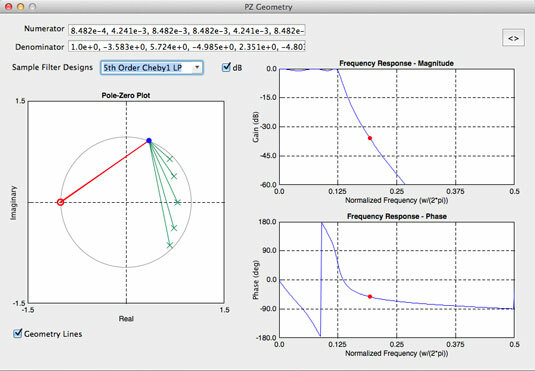 When you’re comfortable with pole-zero geometry and its relationship to frequency response, you can explore filter design through the placement of poles and zeros. Hand placement of poles and zeros doesn’t replace filter design, using formal filter design approaches, but this activity will sharpen your understanding of system function design and frequency response. 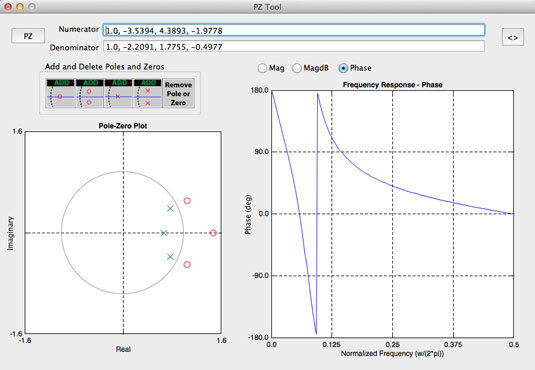 The app PZ_Tool allows you to place and drag poles and zeros around the z–plane and simultaneously view the frequency response. Sampling theory is how you connect the continuous-time domain to the discrete-time domain. When you first study sampling theory, you’re initially concerned with the sampling rate fs (the inverse of the time sample spacing) relative to highest frequency present in the signal being sampled. An animation that allows you to vary the frequency of a single sinusoid signal for a fixed 1-Hz sample rate is the subject of the app SampledSine. 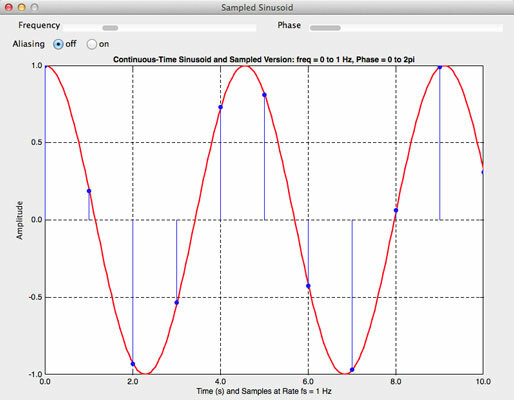 You can observe aliasing in the time domain and why you need more than two samples per sinusoid cycle to allow reconstruction of the signal from its samples. The frequency-domain view of sampling theory is extremely valuable in understanding the impact of aliasing if you don’t sample at greater than twice the highest frequency of a signal having a low-pass frequency spectrum. 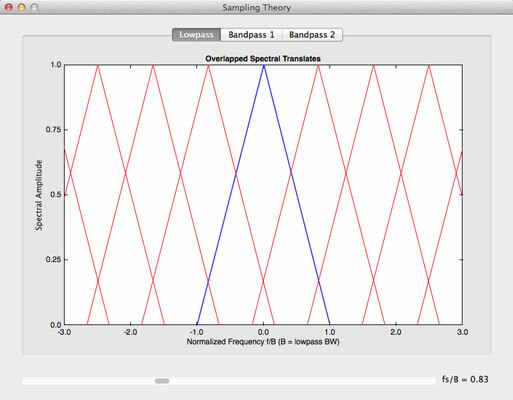 The app SamplingTheory provides an animation of the spectrum of sampled low-pass and band-pass signals as the ratio of sampling rate to bandwidth varies by using a slider control. After you understand the low-pass case, you can move on and explore the band-pass case, which offers some surprises. You can undersample (that is, sample at less than twice the highest frequency) a band-pass signal without suffering from aliasing. Sampling used in wireless communication devices often takes advantage of this fact.